A 1/8 DIN Indicating Temperature Controller, 48-96. This is a Analog Controller built around ICL7107. 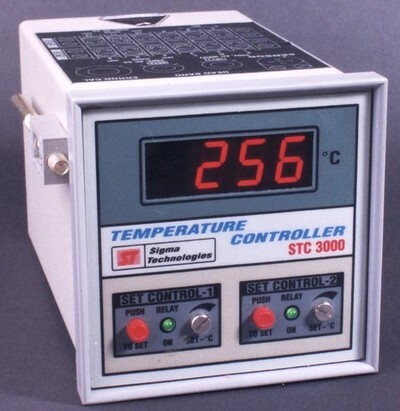 This is a 48-96 DIN Temperature Controller, it is mains operated, it is in a Industrial Plastic Housing. It is not meant for very harsh environments. Suitable for Control Panels in Control Rooms. It has a accuracy and linearity of 0.5%. It had options of on-off or time proportional control. Sometimes uC based instruments just forget and that can be costly, the watchdog timer has solved this problem. In Industrial Process Control we cannot take any chances, so a two tier or even three tier protection is required, especially so if the Job or Raw material being processed is expensive. So Real Time Analog Trip with uC Controller is safe. Then you can still have Electro Mechanical Devices for Extra protection against Fire or Meltdown. Temperature is the most common process parameter, Pressure seems to be next. Flow, Humidity, Strain, Torque, Level, RPM, Distance and many more follow. When a physical parameter let us say distance is measured, we first need a sensor that converts it into electrical values, digital, pulses(events/limit) or analog. The sensor used for length is a Linear encoder and it creates the electrical information for the DRO to Display. Now many sensors like a strain gauge produce very low and weak signals and some are non-linear. So the signals undergo Amplifying, Temperature compensation, EMI/RFI or Noise Cancellation and Linearizing together called Signal Conditioning. This stage outputs some standard values like 4-20mA, 0-10 V, 1-5V, or even directly digital or wireless in the new technologies of today. Even when a digital interfacing standard is used, amplification and some signal conditioning is required at sensor end. Compensation, Linearizing and Noise Rejection can be better done with a uC using Math, Look up Tables, DSP, Software Filters etc.. When you have many different parameters, then it is better to use process controllers with a 4-20mA input standard. Then the inventory of controllers can be limited, as it can be reused for any other process. It is always better to use sensor-end transmitters to get 4-20mA to your Controller, Recorder, Data Logger or SCADA System.Weak signals are corrupted by noise and dont travel a long wire distance. Junction EMF at joints and terminals blocks add to errors. These are overcome by the 4-20mA signal that has the juice and punch to transmit the data over the shop floor to the control panel rooms. Some times Optical or Magnetic isolation and modulation of analog signals is required. When the signal wires have to mesh with high power lines on their way back (not a good practice) or the sensors could get accidental exposed to live energy points; the control room or panel instruments can be damaged. Lastly where corrosive materials are being processed, assume it is always so; Protection is needed for sensors, junctions and wires. When volatile fluids are being processed, the sensors, wires, control units all must perform at low energy levels; sealed hermetically, etc. A tiny battery spark may undo all the measurement and control efforts ! Signal Conditioning and Control Modules on BergStick/soldering.